Summary: Artemis may have found his father, and he is suspected to be smuggling human goods (and weapons) to Faire. The second book in a series makes or breaks the series in my mind. It can either set up the series to be able to go further (usually giving some good background and character development) or it just tells the same story as the previous book. 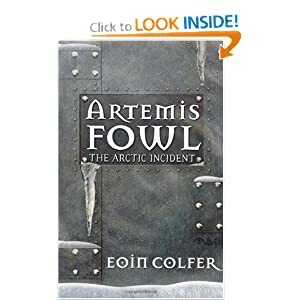 Colfer does a good job of keeping the action and the good parts of Artemis and the other characters from the first book, but developing them enough that you want to keep going. Artemis was much more human in this book. A hero cannot be perfect or there is no tension in the book. And there is tension in this book as Artemis has to work outside his comfort zone. Artemis’s father seems to be alive (and kidnapped). Artemis gets a ransom note, he breaks out of school. On the way to investigate his father, he is picked up by Captain Holly Short of the LEPrecon Unit because he is suspected of smuggling. After helping Captain Short (and proving himself innocent) he enlists her to help him free his father. The ending makes me wonder where the series is going. I listened to this on audiobook from the library.